Interview Series by the Chinua Achebe Foundation (New York, USA) --- He is Nigeria’s Nobel Laureate; a world acclaimed writer, and celebrated crusader for social justice and human rights. 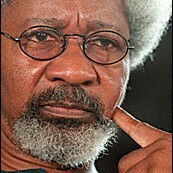 Professor Akinwande Oluwole Soyinka requires no other introduction. Click here to continue reading "Wole Soyinka in Conversation with Omoyele Sowore, Michael Mbabuike, and Okey Ndibe"